Your outfit is really only as good as your accessories. And if you're going to be a 20s flapper, you better have a cigarette holder. Nothing says glitz and glam like long gloves, a feather boa and a cigarette lit in a fancy holder. You know what we're talking about. Breakfast at Tiffany's Holly Golightly, Marilyn Monroe, and Cruella De Vil are just a few famous ladies who used these fancy smoke-extenders. 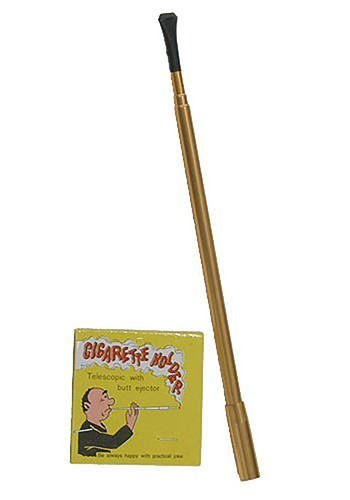 This particular Metal Deluxe Cigarette Holder can extend out to 18" long and is an actual functioning cigarette holder. That's right, real cigarettes fit in the end, and it's got an opening for smoke to pass through. Just in case you're committed to the costume. Or you can do what we did when we dressed up with this baby and stick a candy cigarette in there. You know, just in case you need a little sugary pick-me-up.